The Guardian claims to have access to key findings of the long awaited inquiry into the Bloody Sunday killings of 30 January 1972, and some of the soldiers implicated may now face prosecution almost 40 years after the event. 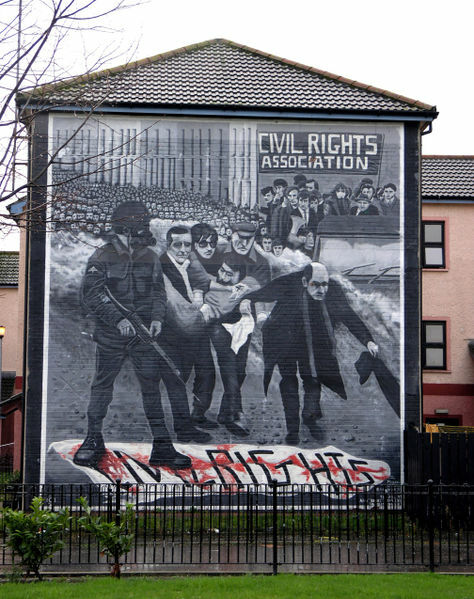 The Inquiry was set up to investigate the events surrounding a march in the Bogside area of Derry in 1972 when 29 protesters were shot by British soldiers, leading to 13 deaths. Lord Saville’s report, which marks the conclusion of the longest and most expensive public inquiry in British history, “will conclude that a number of the fatal shootings of civilians by British soldiers were unlawful killings“. However, the Guardian has not revealed where its information originates from, or how the shootings were “unlawful”, which could mean a number of different things. The report is to be published on Tuesday 15 June at 3pm. The Inquiry’s website, which also has transcripts of the hearings, can be found here. Though witnesses were protected from self-incrimination, an exception was made for perjury. And government law officers made it clear that criminal prosecution against an individual was not ruled out in the light of any evidence that emerged from other witnesses or from documents. The problems surrounding the Bloody Sunday Inquiry led to the passing of the Inquiries Act 2005, which regularised inquiries’ rules and proceedure, giving the government stronger controls over their conduct. Article 2 of the European Convention on Human Rights provides legal protection for everyone’s right to life. In some circumstances this includes an obligation on the state to investigate deaths and ensure the investigation is properly conducted. This can lead to the requirement to conduct public inquiries. These proliferated under the New Labour government, and the new coalition look to be continuing the trend with the recent announcement of an inquiry into allegations of complicity in torture by British state agents. The Inquiry’s findings are bound to be controversial when they are released next week, and may provide some sort of conclusion to an unacceptably long wait for the families of those who died. No doubt many column inches will also follow Lord Saville’s report, which apparently runs to 5,000 pages. Much has happened in the intervening decades since the original events. The report will bring into focus the enormous political advances which have taken place in Northern Ireland between 1972 and 2010, and particularly since the Good Friday agreement in 1998. Questions will immediately be asked about whether prosecutions must follow the findings, and whether it can really be said to be just that men who were in their 20s in 1972, and have now retired, are to be prosecuted for crimes that happened nearly 40 years ago. A criminal trial in those circumstances, relying on witness testimony based on 40-year-old memories, may run foul of the Article 6 (fair trial) requirements of the European Convention. But prosecutions may ultimately be necessary in order to draw a line under the affair. The worst possible outcome would be for the findings to reignite tensions in a region which finally appears to be returning to normal.